You may find answers here to the questions we often receive from folks who call or email us. If the answer to your question is not here, we invite you to send us your question, or to call our office at 617 825 1360 and we will do our best to answer it. 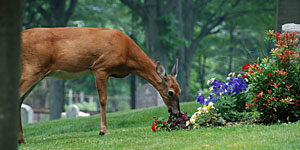 How may I arrange for a planting or a flowerbed at my loved one's grave site? Our greenhouse staff offers gravesite plantings each spring, or you may plant and maintain your own flowerbed. See More Information. What do I need to know about purchasing and placing a monument or marker on a grave? Before you purchase or arrange for a monument or marker, you need to become acquainted with our Guidelines and Procedures for Purchase and Placement of a Monument or a Marker on a Grave. How old is the Cemetery Office, and has it always been an office? The Cemetery Office, at the Adams Street entrance, near Milton Street, was designed by Dorchester architect Joseph T. Greene (1862-1911). 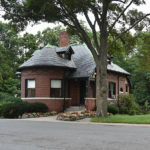 Its estimated cost was $5,000 and it was constructed in 1901. The building has always served the function of cemetery office. Where are the flowers that I placed on my loved one's grave? We often get questions about what’s happened to flowers, and people ask why theirs have disappeared while others are still in place. The answer is that all plants become a part of the natural cycle of life. Our deer population, which we love to see in the landscape, are also fond of nibbling on that landscape. We cannot always “catch them in the act,” so we are reconciled to sharing this natural space with the wildlife which frequents it. 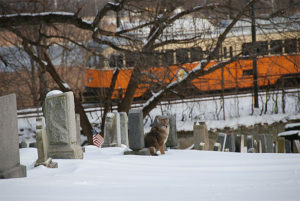 Is it true that a trolley runs through the middle of Cedar Grove Cemetery? Yes, that is true! Cedar Grove Cemetery is the only cemetery in the United States with a trolley running through it, and It is mentioned in both Ripley’s Believe It or Not and Harry Fig’s Believe It or Not (by Peter Wallace, Boston Sunday Globe, August 4, 2002, left). The Cemetery is located along the Mattapan-Ashmont “Red Line” of the Boston MBTA, still running today. The recent photograph at left shows the trolley running through the cemetery. If you look closely, you will also see a fox seated amongst the headstones. Cedar Grove Cemetery still preserves its natural setting along the Neponset River. Beginning on August 26, 1929 the trolley ran from Ashmont to Milton. As of December 21, 1929 the line began extended its service from Milton to Mattapan.